Are you struggling to know who your ideal customer is and how to reach them? Does it feel like a guessing game that only leaves you frustrated and still unsure? 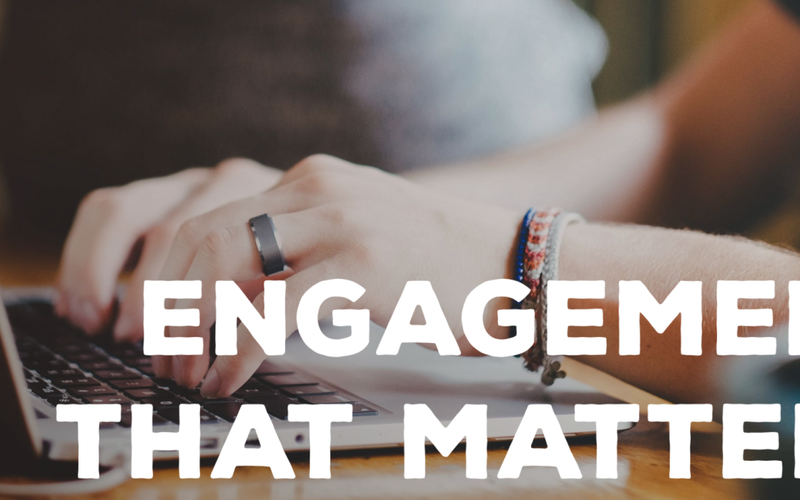 If you are confused about how to reach your ideal customer, here are a few tips to help you get engagement that matters on your social media business pages (mainly focusing on Facebook and Instagram). These are simple steps, but you have to be willing to break your old ways of thinking and be open to taking new steps. #1: Post more live and regular videos, in combination with pictures, texts and links. Starting off with Facebook, let’s talk about the algorithm. You may have heard this phrase and wonder it’s meaning. Maybe you know what it means, but don’t fully understand how it operates. The dictionary definition for algorithm is a process or set of rules to be followed in calculations or other problem-solving operations, especially by a computer. Don’t let the technical terms scare you off; it’s actually straightforward once you understand it. Through the algorithm, the creators of Facebook have found that users prefer live videos, followed by regular videos, pictures, texts and links. You instantly become the highest priority when you post a live video. People will almost always view a video over looking at a picture, clicking a link or reading text. All five resources are essential, but focus more on posting live videos that engage your customers. #2: Ask your customers to engage: Use a Call-to-Action. Once you understand the algorithm, now it is time to ask your customers for engagement. If you are just looking at the Engagement Stats of your business page, you will see Facebook includes ‘likes’, ‘comments’, ‘shares’ and ‘reactions’ in those figures. Although Facebook recognizes ‘likes’ in the stats, a post ‘like’ does nothing to improve your engagement. You want your customer to take a step that will hopefully lead them to spend money with you, attend your event, buy your logo, or utilize whatever other service you provide. There is no commitment in liking a post; ask for more. Use a call-to action in your posts. It is a commitment to comment on or share a post and brings your customer one step closer. #3: Ignore your Facebook business page likes. Remember, the Facebook algorithm is based on percentages, not likes. The quantity of people who like your page does not matter. Let’s say it again, It does not matter how many people like your material. Whether you have 100 likes or 100,000 likes, the goal is to engage the most people out of the pool of people who like the page. It’s actually easier to increase engagement with a smaller amount of page likes. It’s not useful to invite every person on your friends list to automatically like your page. What we do want is a larger percentage of our page likes to engage with our content. If people who are not your ideal customer like your page, they are less likely to engage, which will lower your priority in the algorithm. #4: Differentiate content between Facebook and Instagram pages. Avoid posting the same pictures with the same captions on both Instagram and Facebook. These are two separate formats with different purposes and utilities. On Instagram you want to share beautiful photos and captivating captions, occasionally using links. On Facebook you can get more personal with your audiences. You need to give people a reason to follow both pages, which they won’t need to do if you use the same content. Periodically you can share the same picture and caption on both mediums, but they need different calls-to-action. For instance, on Facebook you could ask your followers to share or tag a friend. Likes are more important on Instagram than Facebook. #5: Find your ideal customer. Often times, small business owners will follow similar businesses to their own. It’s important to be aware of your competition, but you should moreso follow your ideal customers instead. If you are mainly following your competitors, not only are you mentally tormenting yourself, but you are also negatively affecting those percentages we’ve been talking about. Instead of doubting yourself by comparing your business to others’, narrow in on who you want as a customer and engage with them. This can be hard as we often want everyone to be our ideal customer, but that is never the case. You can only reach one set of people at a time. You can’t simultaneously speak to all genders, areas, and age groups. Be specific. You might wonder: Who is the ideal customer? This is the person to whom you want to sell your products or services. It is the person who is going to absolutely love what you have to offer and are earnest to follow what is going on with your company. You need to learn to think like this person. Find influencers who your ideal customer would follow and interact with them and their content. Search for relevant hashtags and go interact with people using it. It’s crucial to continually provide your customers with value. If you show up and disappear, followers will leave and not return. If you went to your favorite coffee shop and they started changing locations and hours, you would stop going and find a coffee shop that stays open for the same hours and stays in the same place. Once you have discovered your ideal customer, choose content that caters to them and post regularly. Have consistent messages and themes with your posts. One way to project consistency is to schedule out your posts and plan to roll them out at similar times of day. Always respond and interact with people who engage with you. Whenever anyone posts on your page, tags you or includes you in a hashtag, become part of the conversation. This shows you are a personable company and easy to reach. #7: Repel as many people as you attract. This isn’t as absurd as it sounds: you want some people to not like you. There should be people who say they don’t want to work with you. When your branding is consistent, you won’t be serving every single person. There should be a certain group of people who adore you, but there should also be those who are disinterested. Make sure you aren’t trying to “people please.” Narrow your focus and you will successfully reach the people you want to, and will divert those who aren’t your ideal customer. Now you have some tools to move forward with your social media execution. You don’t need to play that guessing game anymore. If you start taking these tips to heart, I guarantee you will see engagement activity increase exponentially. Get to it! If you have any questions, send a message or schedule a free consultation call.